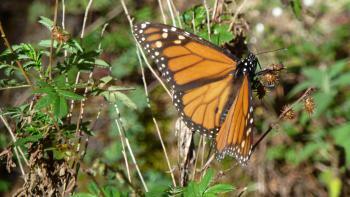 The Monarch Butterfly Biosphere Reserve was created to protect the wintering habitat of the Monarch Butterfly. 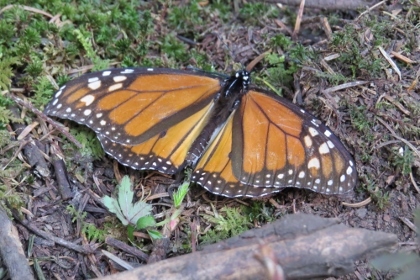 The Monarch is perhaps the best known of all North American butterflies. It also is present in Australia, New Zealand and on the Canary Islands, the Azores, and Madeira. Its wings feature an easily recognizable orange and black pattern. The Monarch is famous for its southward migration starting in August until the first frost, and northward return in summer in the Americas which spans the life of three to four generations of the butterfly. 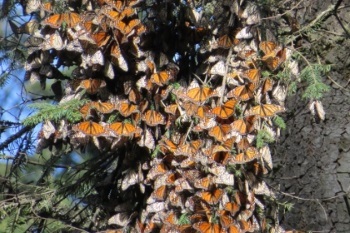 As of the winter of 2007-2008, there were twelve major colonies or sanctuaries of monarch butterflies wintering in Mexico, eight of these are located within the Biosphere. Perhaps a billion monarch butterflies land in close-packed clusters, bending tree branches by their weight, filling the sky when they take flight, and making a sound like light rain with the beating of their wings. This is such a unique WHS, and my visit was all that I had hoped for. I stayed overnight in the nearest city, Zitacuaro. From there it’s an easy drive up into the mountains where the butterflies stay for the winter. The landscape around here is very un-Mexican, more Alpine or Nepalese. I had witnessed that already the day before when driving from Morelia to Zitacuaro via the mountain road #15. There are varying reports about what is the best time to see the butterflies. Considering which month, February is supposedly the best with January and early March as alternatives. The little creatures stay “in bed” (huddled together hanging from a tree branch) when it’s too cold. They will fly out for the day when they feel the sun glowing on their wings, so a sunny day is better than a clouded one. 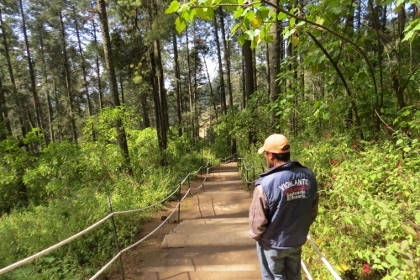 Finally, the parks are the busiest in the weekends when Mexican daytrippers are visiting. My visit as described below was on Friday January 17, and I arrived at the butterfly viewing point at about 10.45 a.m. I choose El Rosario for my visit, as it’s the most accessible park. Entrance to the park is now 50 pesos (about 3 EUR), for which you also get a (compulsory?) guide assigned to you. I was the third visitor of the day. We walked up the mountain slowly, stopping now and then to look for birds (many hummingbirds here) or catch breath. It’s a steep climb on a well-cared for forest path. At the top there is a pretty meadow,parts of the shrubs here were still frozen. You’re really at an altitude here, over 3,000 meters. The guide told me that there had been about 10cm of snow here in early January, it was very beautiful to see the oranje butterflies against the white background. A little further into the forest I first noticed the butterflies hanging from the trees. Really a “Wow!”-moment. It looks just like the trees have lots of rotten leaves on them. But they are sleeping butterflies. When they sleep they have their wings together and you see the white/grey side of the wings. When the sun is out and they flutter about, you see them in full glory orange as that’s the colour on the other side of the wings. 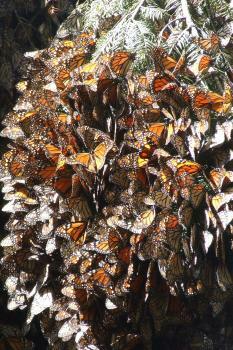 The butterflies stay in a relatively small area, though they apparently cover 1,500 trees. You can watch them from behind a rope. The viewing point actually has come upward over the years, as the butterflies are now staying at a higher altitude than before. They may look close on the pictures, but there’s a distance of some 20 or 30 meters between you and them. Some of the butterflies however are loners and don’t want to huddle with the crowd: you’ll find them anywhere on the path or on a branch beside you. There also lots of dead ones. We stayed for about 45 minutes, hoping that the sun would break through and the butterflies would depart en masse. Unfortunately it didn’t, but at every shade of sun I saw the “early birds” start fluttering about from tree to tree. The sheer numbers and the magic involved how they find their way here each year keeps you thinking though. Inspired by the other reviewers I chose El Rosario to tick off this site. Google Maps does not know it, but once you are within the region it’s signposted, there are not too many roads and people are happy to point you into the right direction. I started my trip from Morelia at around 09:15, arriving on site just before 12. The roads are not great and it felt like there was a speed bump every 100 meters, but the site itself provided such a great experience that I would do it again. Do to my rather late arrival it was already quite warm and the butterflies were very active. Thousands of butterflies flew around me and made me feel like I was in a cheesy romantic movie. The area where the butterflies actually are is rather small, so the time you will spend on site is almost nothing compared to the time you need to go there and back. But still an unforgettable experience and among my favorite sites in Mexico so far. This was one of those spine tingling locations that I never would have visited if it was not for the place on the world heritage list. Even with high expectations nothing really prepared us for the astounding moment when thousands of butterflies burst into the air, a real life enhancing moment! After a wonderful night in front of a log fire in the highly recommended Don Gabino hotel in Angangueo, we had a knock on the door with a friendly local english speaking guide offering his services for the day. Delighted we set off for Sierra Chincua sanctuary, which he said offered an easier ascent and a better viewing experience, both seemed accurate to us. He said that the best viewing experience is at Cerro Pelón, however it is a more remote cluster and is a three hour hike each way to visit it. At Sierra Chincua We actually had the whole sanctuary to ourselves, only encountering other visitors as we were departing. 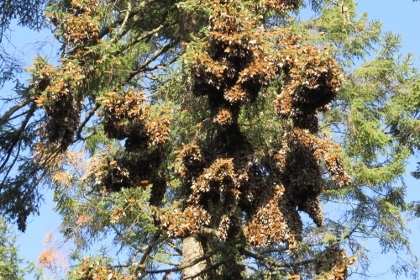 The initial view of the clusters of monarchs hanging in the trees showed them in giant clumps, looking like dead leaves. As we delved deeper there were more and more of these giant clusters the sheer quantity was staggering. It was still cool and they were mostly all huddled together but there were still a lot stretching their wings and flying around. Being the only people around I was amazed that I could actually hear the butterflies flapping their wings as they fluttered around the tree tops or came close to pay us a quick inquisitive visit. Due to the cloud conditions our guide recommended a short break at a viewpoint, which showed the landscape of dormant volcanoes and gave us a chance to take in what we had seen. On our return to the butterflies our guides intuition proved precise, a small change in the micro climate meant that more and more monarchs were up and flying. Standing in amazement at the spectacle in front of us we weren't prepared for a small cloud briefly covering the sun, ... and then ... a burst of activity. 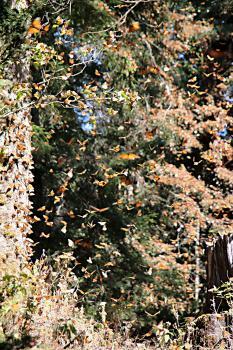 From every tree thousands of butterflies all took off at once, filling the sky and leaving us awestruck. Everything else just stopped and for one brief moment the only thing that mattered was the spectacle in front of us. A wonderful world heritage site and a life enhancing experience. We are keeping our fingers crossed that the Monarch Butterfly forests will be inscribed this year – not just because it will add to our “visited list” but also because it is clearly such a world class natural site! What can stop it? Well, IUCN often seems more concerned with “process” than the inherent value of a site so perhaps the buffer zones haven’t been adequately defined or else the management plan isn’t thick enough! Actually, when we were there in Mar 2008, we felt that the Mexicans were doing quite a good job at balancing the “needs” of the butterflies with those of the large crowds who had come to see them. Down below at the bus station and car park and for some of the pathway up there was a carnival atmosphere – Mariachi bands and all sorts of Mexican food goodies. One got the feeling that a spring trip to see the butterflies was a traditional “good day out” for many and indeed some of the “oldies” looked as if they may have been doing the trip annually for many years – despite the steep climb (allow up to an hour given the crowds on the path)!. As you approach the butterfly area, the ground becomes covered with the bodies of dead insects – one of the amazing aspects of this site is the way it brings home the sheer profligacy of nature. But there is a reasonable number of wardens to rope off the path and to guide tourists to the remarkably few trees where the millions (billions, trillions??) of the insects are gathered together for warmth. Their weight is such that the branches on which they settle are visibly sagging. Visitors are kept back from these trees but the views are perfectly adequate. Most only stay half an hour or so but there is a steady stream and usually a hundred or so people at each of the 2 main “tree areas” at any one time. Given the number of children who have come, a reasonable quietness is maintained. People are clearly entranced by the magic and mystery of this natural phenomenon. We were there on a partly cloudy day but, every 5 minutes or so as a cloud moved away from the sun and the warmth filtered through the trees, countless butterflies would leave their branches and flutter up into the air filling it with their orange and black. So many wings were beating that you might feel that you could actually hear them - the Web site i refer to below describes it as "the whisper of thousands of voices". In its way this sight was as memorable as other great natural gatherings around the world such as the Wildebeest crossing the Mara or the massed King Penguin colonies on S Georgia.